This week I am checking my list and wrapping all the gifts making sure I’m ready for Christmas in just a few short days. Today I am sharing a simple personalized stocking idea that you can pull together this week to create a cute teacher gift. It’s personalized and stuffed with essentials any teacher can use including BAND-AID® Brand Adhesive Bandages. Teachers are always prepared and seem to have everything their class needs to have a successful school year. 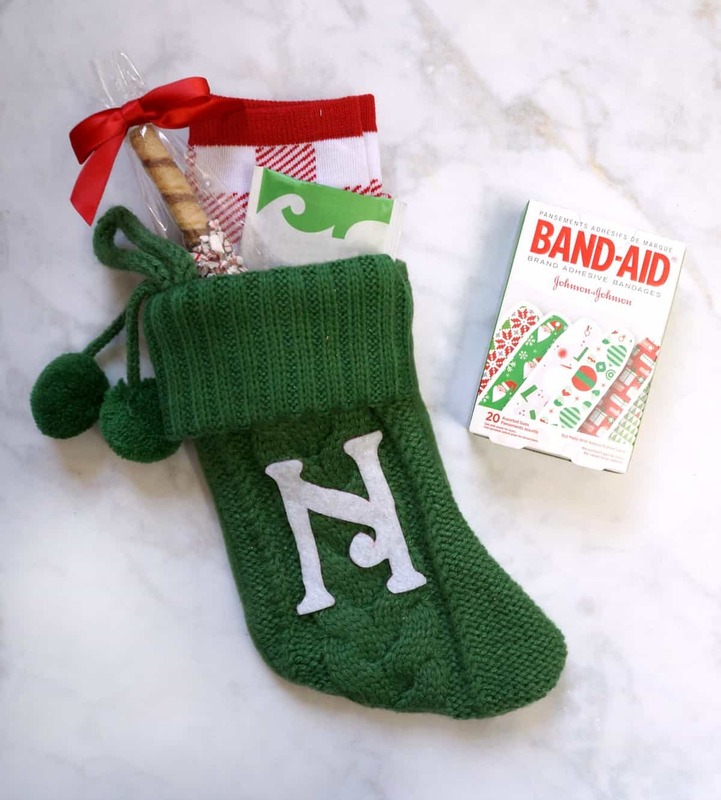 This stocking is filled with items they can use and enjoy over a much needed winter break. Teachers amaze me and deserve so much love and respect for the work they do. I am thrilled at how my children are growing and learning under the guidance of their teachers. I want to gift them a little something they can use to enjoy a winter break and refresh for the new year. 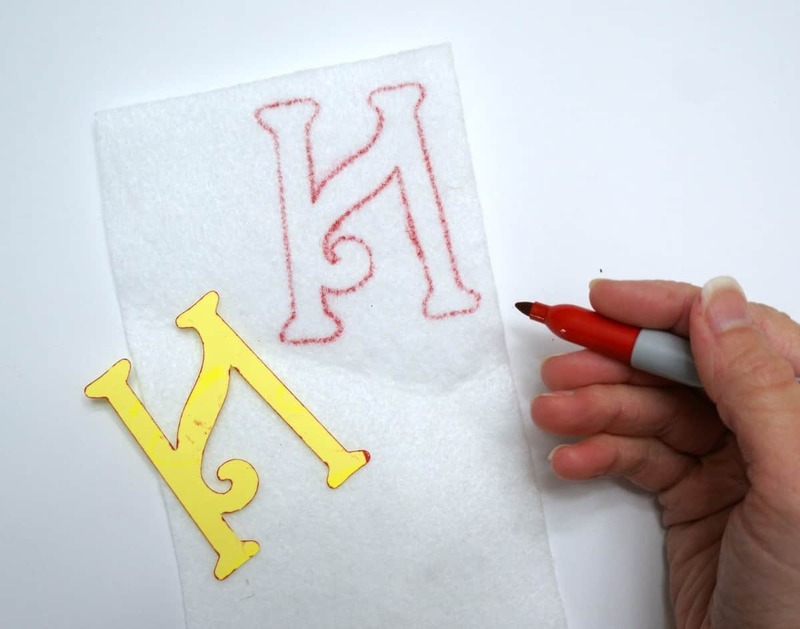 Here’s how you can make a personalized stocking teacher gift. 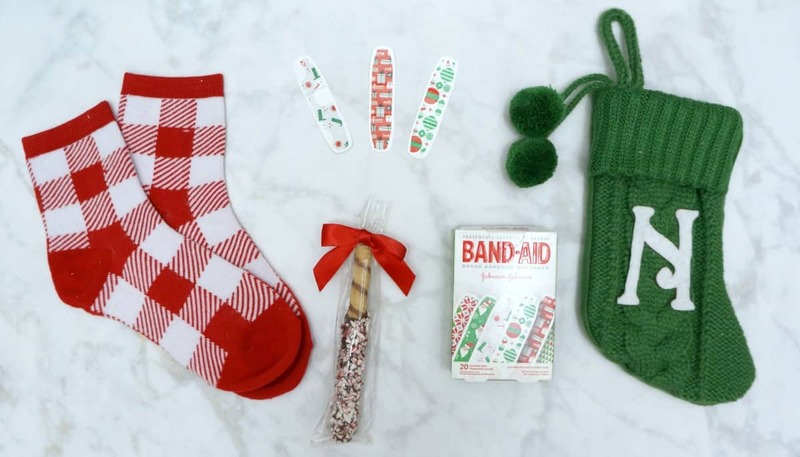 I picked up all of the supplies and stocking stuffers at Target, be sure to hover over the photo below to shop for the BAND-AID® Brand Adhesive Bandages holiday collection. I started by tracing a fancy letter N onto the back side of white sparkly felt, then cut it out. 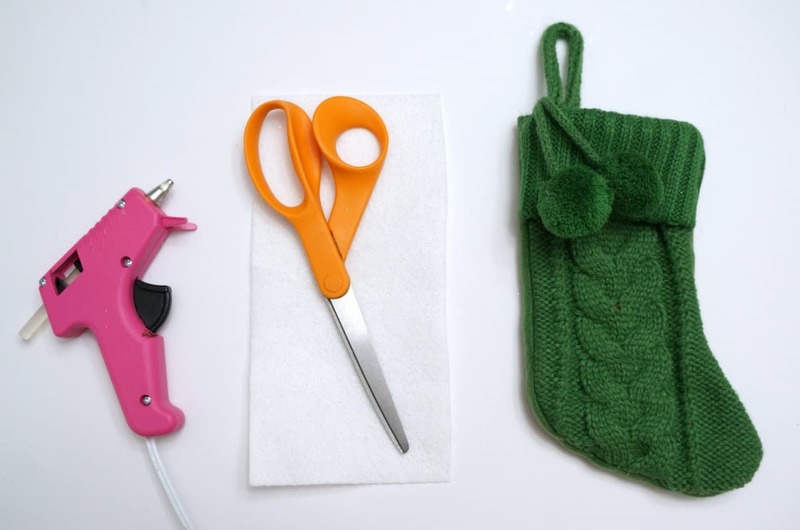 I used hot glue to attach it to a green knit stocking. 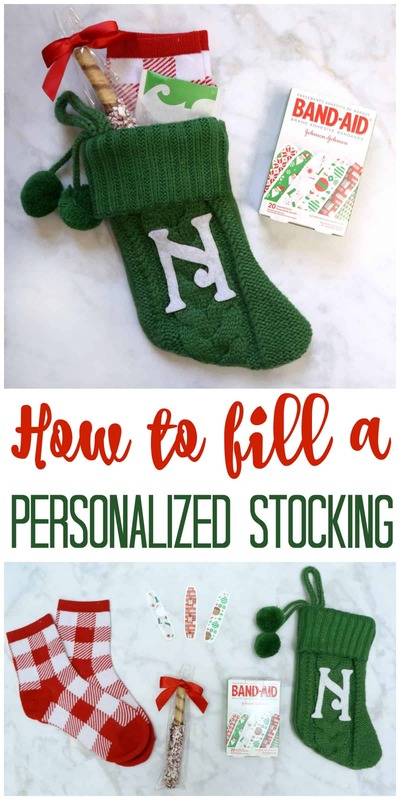 This is such an easy way to personalize a stocking for anyone on your gift list. I wanted to fill this stocking with items a teacher can use. I browsed my local Target and picked up these adorable BAND-AID® Brand Adhesive Bandages. Everyone needs a box on hand; a few for your purse, some for work and home too. BAND-AID® Brand Adhesive Bandages are the #1 Doctor recommended brand and heal hurts faster. I also picked up a few packets of mint tea, a chocolate treat, and some cozy socks to fill this stocking. I added a Target gift card as well so this teacher can do a little post holiday shopping for herself. 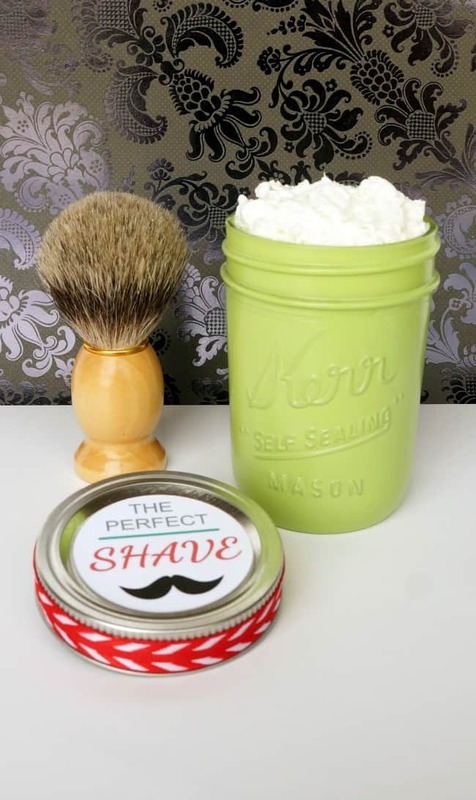 These stocking stuffers can be personalized for just about anyone on your gift list. You can feature Paw Patrol and Star Wars BAND-AID® Brand Adhesive Bandages and pair them with items that fit that character theme. 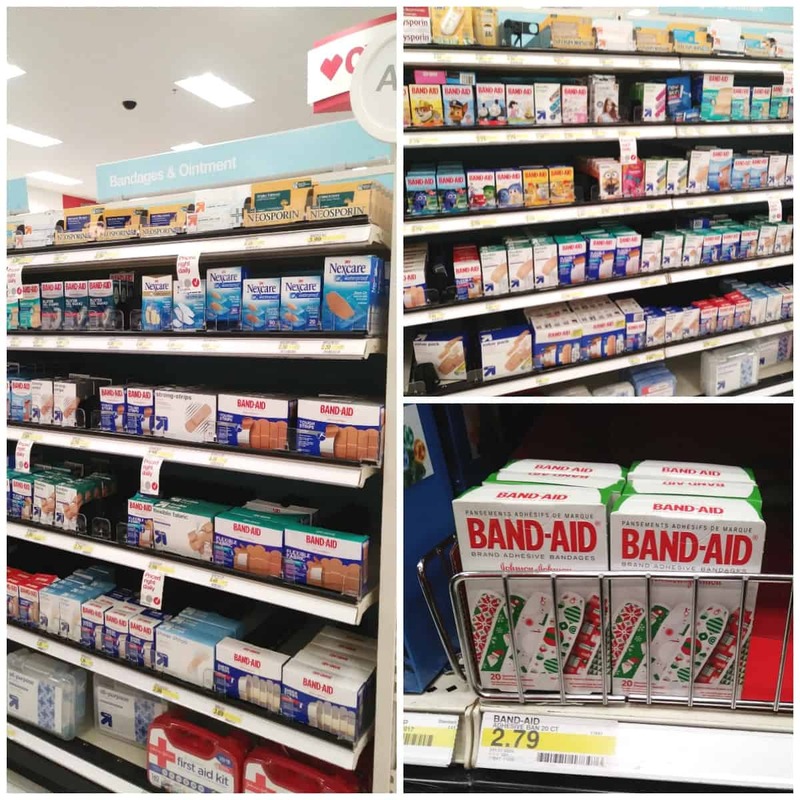 BAND-AID® Brand Adhesive Bandages are in the Target ad the week of 12/17 for 2 for $5 so it’s a great time to stock up on gifts and for yourself. This personalized stocking is easy to make and will complete your gifting for the season. 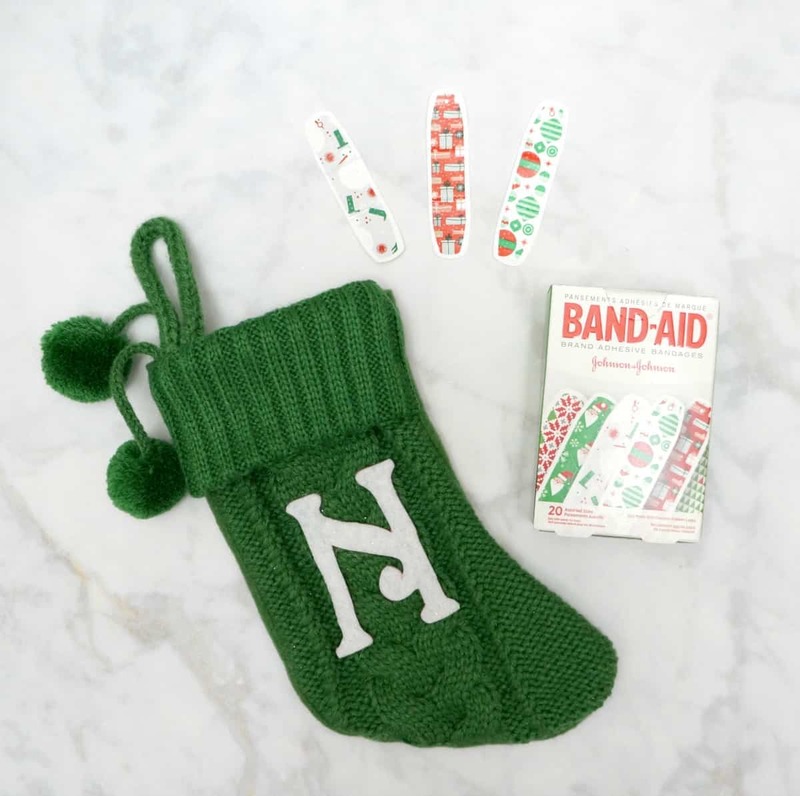 Be sure to pick up BAND-AID® Brand Adhesive Bandages holiday collection and all your stocking stuffers at Target and tell me, what will you add to your personalized stocking? all cute things! I love the monogram too!